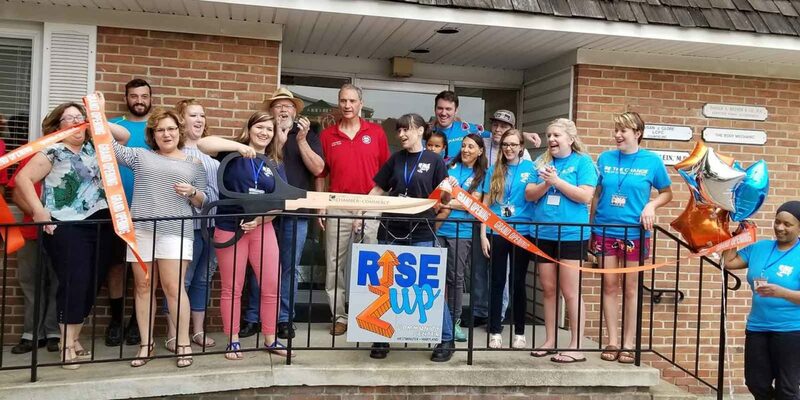 Rise Up community center opened its doors in June at 280 E. Main Street in Westminster with a mission to support local teens. Offering a youth-driven program, the goal is to provide a safe space for youth to discover their strengths and learn to overcome challenges. At Rise Up, youth aged 12-18 create the culture, set expectations, create goals, plan and coordinate daily activities and service projects, and hold both themselves and their peers accountable, according to Executive Director Katie Kirby. “The work we do at Rise Up is only made possible when we can rally the community behind us,” Kirby said. Still a fledgling organization, Kirby said that the community can help support their mission by offering job shadowing opportunities and donating time, materials and money to support programs. Youth are referred to the all-volunteer organization by law enforcement, therapists, school counselors, and parents or the youth may refer themselves if they recognize the need for more support. Each youth referred to the program will go through an intake process before they are eligible for services. Rise Up offers a variety of support services to include crisis intervention, mental health counseling referrals, job training, mentoring and leadership training. To learn more visit www.weareriseup.org. Tickets: $25–50 • Carroll County Farm Museum • Learn more at www.marylandwine.org. Event highlights include sampling of more than 150 Maryland wines, a local cheese pavilion, juried artisans, live music and local food vendors. 11am-5pm. Union Mills Homestead and Grist Mill, 3311 Littlestown Pike, Westminster. www.unionmills.org. Come enjoy an old-fashioned meal featuring corn roasted in the husk, served at your table. Noon-6pm. Carroll County Farm Museum, 500 South Center Street, Westminster. www.carrollcountyfarmmuseum.org. Food, wines, reggae music and arts and crafts vendors. This fall Sykesville youths are going to find themselves at the center of crime scene investigations with local police. And they can’t wait for the fun to begin. The Sykesville Police Department will again be inviting students to attend a four-week course that gives them unique insights and understanding of crime scene investigations. This year will mark the 10th anniversary of the program. The Junior CSI Academy will be led by Sykesville Police Chief Michael A. Spaulding, with participation from other law enforcement officials from Maryland State Police, the Carroll County Sheriff’s Office, Baltimore County police and Baltimore City police. Students will learn about the various facets of crime scene investigations including fingerprinting, grid searches, the importance of learning how to locate, photograph and collect evidence and how to maintain the integrity of the crime scene. “This program is an important part of our community policing efforts here in Sykesville, and we feel the real value is interacting with the youth of our town and for them to get a chance to know us in a non-intimidating setting,” Spaulding said. Classes are scheduled from 4 to 6:30 p.m. on Tuesday evenings at Sykesville Middle School, culminating with a final exam and graduation on the last day. On the final exam day, students will face “mock” crime scenes which will be laid out in various locations at the school, according to a police department news release. The class dates are Sept. 18, 25 and Oct. 2 and 9. Applications for the program can be obtained at the Sykesville Police Department, Sykesville Middle School or online at www.townofsykesville.org. Class size is limited and applications will be processed on a first-come, first-served basis. Call the Sykesville Police Department for more information at 410-795-0757. Fresh produce, meats, eggs, cheese, herbs, honey, nuts, pickles, baked goods, crafts, jewelry and more. Bring the kids to get a first-hand peek at a firetruck and police car. Enjoy everything apple as well as craft making, scarecrow making, hayrides, music and entertainment, along with many local vendors selling their wares, and the Nature Center will be open to visit. Park entrance fees apply. With 20 years in the flower and wedding industry under her belt, Victoria Clausen said she is excited to put her experience and energy to work in Taneytown. Clausen opened Floral Fêtes in June with hopes of offering unique services and giving people a place to find delightful gifts and local inspiration. Clausen said she never really dreamed of having a flower shop, but said the space presented a good opportunity for a flower shop that also offers locally made gifts and unique items as well as features local artist works. “I always thought it would be so cool to have a little place where people can buy beautiful gifts and flowers that can serve as an inspiration,” Clausen said. Paulsen has worked in the wedding and flower industry since 1999. She said she started out doing weddings and small parties and now her company does larger events and big galas. Floral Fêtes carries mostly items – including soaps, jewelry, artwork, garden items, hostess gifts – that are locally made, made by small businesses and made in the U.S.
Floral Fêtes is also a finalist in this year’s Carroll Biz Challenge – a local contest that encourages entrepreneurs to pitch business ideas and compete for a $5,000 cash prize. Floral Fêtes is one of five finalists, the winner will be announced at a finale event on Aug. 9. Floral Fêtes is located at 14 E. Baltimore Street in Taneytown. Visit www.floralfetes.com to learn more. Community-building event that promotes police-community partnerships and neighborhood camaraderie to make our neighborhoods safer, more caring places to live. There will be live music, beer and wine garden, craft and food vendors, kid activities and more! Members of the Magna Domos Crossfit gym and the broader Hampstead community rallied to raise money to install a pool lift so fellow crossfitter Marsha Derrickson could get in the water after suffering the affects of ALS. Derrickson started taking classes at Magna Domos Crossfit gym, located at Four Seasons sports complex in Hampstead, in 2013. In 2016 she was diagnosed with ALS – a progressive neurodegenerative disease that affects nerve cells in the brain and the spinal cord. Derrickson, who lives in Hampstead with her husband and two sons, has lost the use of her legs and now uses a motorized wheelchair to get around. She said the pool is the only place where she can walk on her own because she doesn’t have to deal with the weight of her body. Stacey Gruber, an instructor at Four Seasons and Magna Domos, spearheaded efforts to raise the $3,500 for the lift that would help get Derrickson, and others needing assistance, into the outdoor pool. Through a series of fundraisers and donations, by early July, $2,000 had been raised and because they wanted Derrickson to be able to get in the pool right away, they went ahead and installed the lift at the Four Seasons pool, still needing to raise close to $1,500. To learn more, visit www.magnadomos.com or call 443-858-1317. Learn about clogging at the North Carroll branch library on Saturday, Aug. 11 at 1 p.m. For all ages. Join the dancing fun with the longest continuously active clogging group in Maryland. Clogging originated in the Appalachian Mountain folk dances of the 1800s – often a mix of the jigs and step dances brought to America by English, German, Scottish, and Irish settlers. See a live demonstration and learn about the heritage and history of clogging. A Celebrating America program. Call 410.386.4488 for more information. Free outdoor concerts sponsored by the Hampstead Train Station. “Sweet Summer” featuring sangria and sweet wines. Rides, food, fun and entertainment. It’s been a labor of love and has taken several years to come to fruition, but on Aug. 25 the Mt. Airy Historical Society will officially open the doors of its new museum in the renovated Train Station at 1 N. Main St. The grand opening celebration will take place during the third Celebrate Mount Airy festival in the downtown area. The renovation of the old train station is the latest in a series of train-related projects the town has invested in over the past several years. In 2016, the town restored an old B&O caboose, named Mackenzie. It is located across the street from the old train station. The town also brought to life the Mount Airy Rails to Trails project – a mile-long walking/biking path that allows visitors to journey along the same path the train used to travel. The Mount Airy Museum, previously located in the Flat Iron Building, at the corner of Main Street and Park Avenue, will have new displays that reveal some never-known history of Mount Airy, according to the Historical Society’s Facebook page. The Garrett Sanitarium and the Mount Airy Railyard will be feature exhibits. The museum will be a work in progress for the rest of this year and into the winter, so be sure to visit regularly to watch it evolve. Visit www.mountairymd.org/196/Historical-Society to learn more. Unique street festival features food, businesses, and community organizations. Featuring speakers, and history programs focusing on Mount Airy and Maryland history. Over 250 booths with various items for sale.